Time to get rid of those old crutches? Our woundings define us, control us, give us structure and purpose. They offer crutches so we can limp along through life making the best of it. What would happen if we threw away those crutches, if we decided to let go of everything we think we need and instead go in search of our dreams? If we lose touch with our dreams we lose touch with our spirit. The only way of getting back to our spirit is to get back to not only dreaming our dreams but actualizing them, and to do that we must get rid of our crutches. 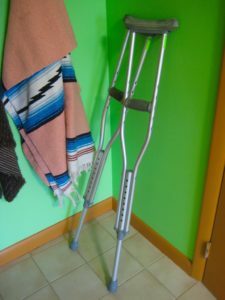 Crutches can be everything from ideas, such as that we are not worthy of success, or a mate, or wealth or health, that we must bear the life we have, continually punishing ourselves because of some idea that that’s just the way life is, or because we repeatedly blame someone else for hurting us, for leaving us, for abusing us. Well, it doesn’t have to be that way. Crutches are also our comforts, and that’s where it gets tricky when we try to let them go. Part of us wants to just throw them away, but if we do will our back and legs be strong enough to carry us forward? Will our feet know where to take us? Do we have what it takes to go it alone without our crutches? Whatever our crutches may be they will try to convince us that we need them, that we can’t live without them, that we owe them for how they have helped us survive. How can you leave something, or someone, that has been so important to you? How can you just walk away? When the time comes to change, to move on, to throw away the crutches, we have to dare ourselves to stand on our own two feet. It can feel as if we are throwing ourselves into the great unknown, which we are. As if we are jumping off a cliff, which we are. As if we are taking a great leap of faith, which we are. The first thing we will encounter as we take that leap is fear. During my recapitulation such times of free fall indicated that I was actually making strides. I was being challenged to embrace life, to get out of my safety zone and confront reality. Perhaps letting go of a crutch meant challenging myself to go beyond my depression, such as: “I won’t stay in bed all day today. Today I will go to the grocery store, or make a phone call, or take a walk.” Such simple things, you might say, but to a traumatized person these present major feats. Sometimes every day could be like that. Perhaps a moment of free fall was instigated by an outside influence, such as someone requesting something of me, someone else needing me, or a job that needed to be done. To go outside our comfort zone when we have been badly wounded takes courage, fortitude, and strength, such ordinary characteristics of being human that for someone suffering from PTSD present mountains to cross, rivers to ford, the great unknown to encounter, and all without our usual crutches! If we are to heal we have to change, and if we are to change we have to leave our crutches behind. The things that now keep us safe also keep us isolated, lonely, stuck in reliving our woundings and our ideas of ourselves as wounded, over and over again. “I am wounded, poor me! I will never have a good life because someone did something bad to me! I have trauma in my background so I have permission to be sad and lonely. It’s my lot in life.” These are some of the things we tell ourselves to keep us aligned with our woundings, and each time we speak them our crutches are right there for us to grab onto, saying, “Yes, you need me. I told you that you would always need me. You don’t need anything else. I am here for you.” Are we really going to settle for that? We are easily convinced by our crutches because the truth is that yes, they have been our salvation, they have stood by us through it all, and they have worked for us, to a certain extent. But they have also kept us stuck in our nightmares, and the truth is we would be better off without them. We’d be healthier without them. I used to run every day. It was one of my crutches. I thought I needed running to survive. I have not run in 12 years now. I just stopped one day. At first I felt bad about not running, thinking I’d get out of shape, physically and mentally, and for a long time I’d whine, “Oh, I should be running.” But I never did again and once I really let go of it, in my mind too, I was just fine. I am physically and mentally healthier than ever. I don’t need to rely on running anymore. I have myself to rely on. Times change. We change. As we choose to heal from our traumas, our dreams come back to haunt us, reminding us of what we have left behind that might really matter to us. In the long run, it’s our dreams that we should go running to. Is it time to throw away the crutches and go running toward your dreams? In this time of #METOO, it is so important that we point fingers, that we expose the hypocrites, that we gather together, united against what has been going on in the shadows, but at the same time we can’t just stop there. It does no one any good if all we do is point fingers. If we are to heal our wounds we have to be willing to do the healing work, and that is an individual task. No one else can heal our wounds for us, for only we know what they truly are. Only we know what they have done to us and how we have survived with them and in spite of them. And only we know what all of our crutches are, many of which we have kept in the shadows of our own psyches. Healing can only happen if we are each ready to take the personal journey within. If we are to heal we must put down our crutches, one at a time, and head off into free fall. In the end, I can attest, that we will land on our feet, and that our own two feet are indeed strong enough to bear the tension of taking back our health and our energy, as well as take us where we will go next. Time to take the dream back.